Alloy Steel P22 Pipes & Tubes Exporter & Supplier, High-Quality P22 Alloy Steel Pipes & Tubes Stockist & Manufacturer. ASTM A335 Alloy Steel P22 Pipes & Tubes Exporter, ASME SA335 Alloy Steel P22 Pipes & Tubes Supplier. Solitaire Overseas Is A Manufacturer, Exporter, Supplier & Stockist Of Alloy Steel P22 Pipes & Tubes. Alloy Steel P22 Pipes & Tubes Are Durable, Rigid And Are Wear Resistant In Nature.We Offer Alloy Steel P22 Pipes & Tubes In Different Sizes & Grades As Required By Our Clients. Alloy Steel P22 Pipes & Tubes Has Wide Applications. Alloy Steel P22 Pipes & Tubes Are Used In Power Plants, Atomic Force, Marine Applications, Heat Exchangers, Boilers, High-Temperature Services, Oil & Gas, Ship-Building, Heavy Engineering Industries, Superheaters, As Transportation Fluid Etc.Solitaire Overseas Offer High-Quality Alloy Steel P22 Pipes & Tubes At Lowest Price. Alloy Steel P22 Pipes & Tubes Are Inspected And Checked By Us And Then Supplied All Over The World. We Have A Large Stock Of Alloy Steel P22 Pipes & Tubes In India. 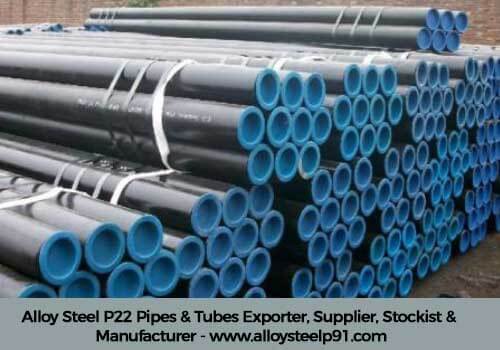 We Stock And Supply Alloy Steel P22 Pipes & Tubes All Over The World. Grades : ASTM A335 Gr. P5, P9, P11, P12, P21, P22 & P91, ASTM A213 – T5, T9, T11, T12, T22, T91, ASTM A691.